Dubai is well known globally for its striking and luxurious resorts, many of which are located on stunning offshore islands and boast unique and awe-inspiring features. This reputation is set to be enhanced with plans revealed to build the world’s first underwater luxury vessel resort off the coast of the emirate. The Floating Venice project will be built to the tune of US$680 million at The World Islands, located 4km offshore. 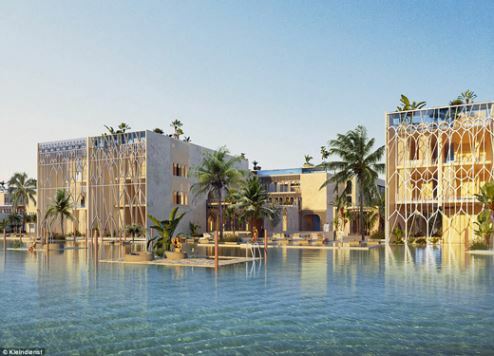 It promises to bring an authentic Venetian experience to the Middle East, the developer said in a statement. The new floating resort will have the capacity for up to 3,000 guests daily, with accommodation, restaurants and recreation components split over four decks, one of which will be underwater. Guests will arrive by boat, seaplane or helicopter to the main Piazza San Marco where they can check-in at the underwater lobby. Gondolas imported from Venice will transport guests to their cabins through winding canals, or alternatively a short stroll through canal-side walkways and bridges will take them to their awaiting cabins. This one-of-a-kind resort will feature a range of 414 bespoke cabins alongside boutique hospitality spots and traditional artisanal shops. In a bid to establish a reputation as a hub for arts and culture, The Floating Venice will stage traditional festivals such as Carnivale di Venezia, Binnale di Venezia and Festa del Rendentore throughout the year, bringing the resort alive with the flair and heritage of Venice. The Floating Venice also offers 24 pools, some of which will have acrylic bases to afford views of the coral reefs below. More than 400,000 sq ft of coral will be planted around The Floating Venice as well as 12 floating beaches. A collection of 12 restaurants and bars will offer a variety of entertainment, three of which are underwater, while the resort will also feature the world's first floating underwater spa. The Floating Venice has been designed to have a lifespan of at least 100 years. Construction is scheduled to begin early in 2018 with completion due by the fourth quarter of 2020.